Added the ability to export a portion of the currently playing video to a separate movie file. This is useful for isolating key portions of a dashcam movie, say for providing to law enforcement or uploading to YouTube. When the Export Clip button is clicked you will be asked to enter the duration of the clip in seconds. You will then be able to select a folder for the output file. 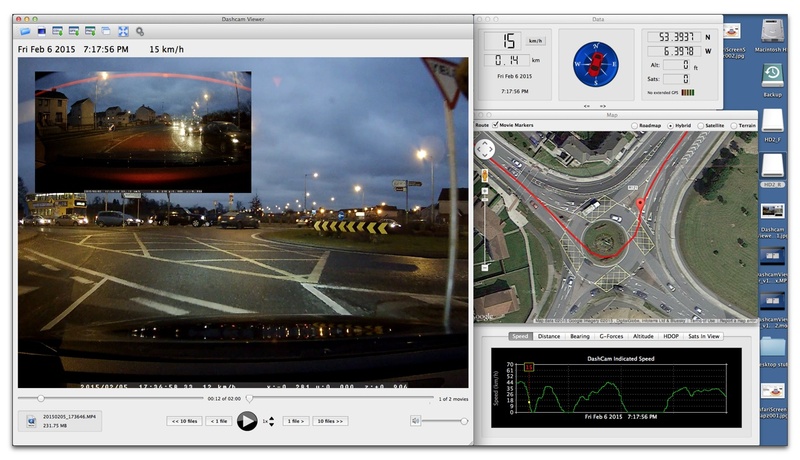 Dashcam Viewer will create the clip, starting at the current movie position, in the desired folder with an auto-generated filename derived from original movie name. No re-compression of the video is performed so that movie details are preserved. Insert both SD cards from the X2 into your computer using a memory card reader. Rename the two SD card images on the desktop “HD2_F” and “HD2_R” for front and rear, respectively. Added preference to choose between Google Map or Bing Map for the Map view. Added keyboard shortcuts to the Graph view to shift the Timezone Offset by -10, -1, 1, or 10 seconds. This is useful for syncing the video to the GPS data. See Shortcuts for more info. Null route points at lat/lon 0E/0N are no longer displayed on map.